Wow David , absolutely stunning.. 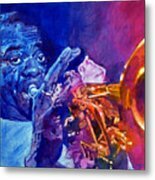 This is one of my best selling prints. Thank you to all the Art Collectors who have purchased. Congratulations on the sale of your art, may you continue to be successful in your sales! Wow !! 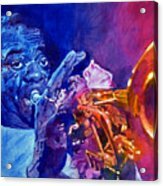 --beautiful selection of colours--very cool subject;love original African American jazz music...excellent work David.Hilton. 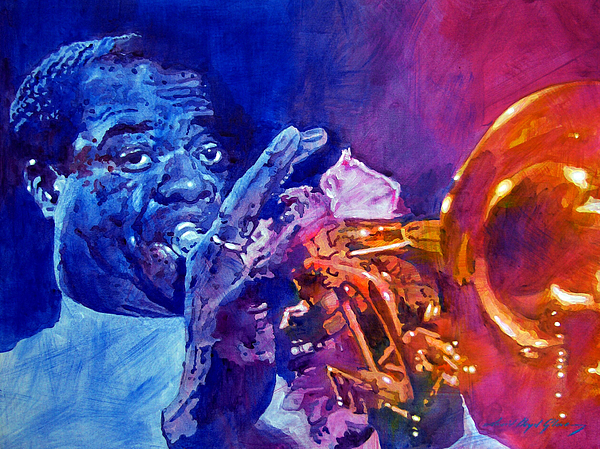 Hitlon, thanks for your comments...jazz makes me go wild with my color palette. David, this is absolutely fantastic! I'm sure even "Sachmo" himself would find it breathtaking! Thank you for your gracious comment about my painting. Way to go, David. Lots of red dots lately! Chuck, thanks and I hope many more red dots. Love this of Louis! Beautiful handling of the color and the depth you created. Congrats on the sale! Hi Elizabeth, thanks for your notice on Louis! THEY CALLED HIM THE AMBASSADOR OF JAZZ. 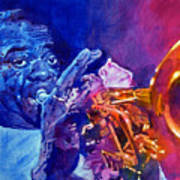 AT ONE POINT, LOUIS ARMSTRONG WAS ONE OF THE MOST RECOGNIZABLE PEOPLE IN THE WORLD.